Think about putting Sedum Angelina, pale purple ghost plants, and silvery Echeveria in a bowl and displaying them on the kitchen table or countertop. These flowering succulents also look stunning on a patio garden. If you align thimble cactus and golden barrel cactus with perfect symmetry, in a mini flower bed or box, you can have a beautiful flowering succulent garden to display nearly anywhere. Consider spreading some charcoal-colored gravel in between the succulents for added texture. Purchase, or make, a planter box that you can affix on a wall and fill it full of flowering succulents. Pack them in tight for the best effect, and consider playing with design by making shapes with different colors of your flowers. Find some large ceramic pots and grab yourself at least five varieties of flowering succulents of different textures, and of varying heights. Kangaroo paws, Coral Drift, and Afterglow are perfect for creating a textured flowering succulent arrangement. If you have even a bit of land to work with, border off an area and create a miniature succulent landscape (you can create a flat bed on a patio for your landscape too, if you have room). Use succulents that flower in shades of plum and pink. Put some flowers in the ground and place a handful in pots on top of the ground. 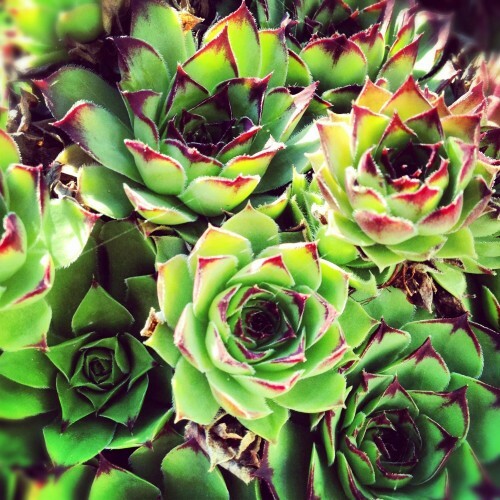 As you create floral art with succulents, keep your mind open to spontaneous inspiration. Have fun with your masterpiece in progress, knowing that whatever it looks like when you’re done will surely be beautiful.